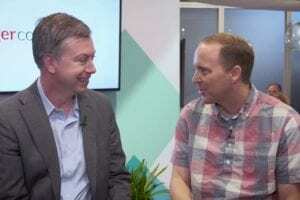 What data from social media can help healthcare organizations? One of the biggest challenges of online and social data is the sheer volume of unstructured data. Can your physician read all your tweets and postings? Hopefully not. Physicians have data and work overload, a daily report of steps taken from activity trackers or online social media use hurts their ability to treat patients. 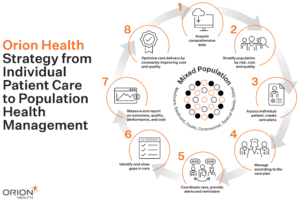 HealthIT solutions can help process this data and find patterns and changes. 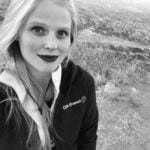 I had a conversation with Audun Utengen about actionable insights into healthcare from his company, Symplur. At Datapalooza he participated in a panel and mentioned the rich amount of patient data that can be found on twitter (shocked gasp followed by a furrowed brow). Symplur signals tracks online engagement. You can find healthcare insights from conversations really quickly. They provide tools that help healthcare providers get patient insights where they are naturally interacting. There is value in meeting patients where they are, and patients are discussing their healthcare online. Originally, the assumption was that patients would not say things online. Sensitive topics do not naturally show up in social media use- fewer people are discussing gonorrhea online than receive treatment for gonorrhea. Providers assumed that things which are protected patient information would not show up on twitter. They were wrong. As most social media users know- it’s shocking what people will post online. Not every aspect of health is on twitter but patients want to engage online. They go to twitter because they want their voices to be heard. They want things to change. They can’t be ignored on twitter. They want their voices to be heard by people in decision-making positions. Patient’s online discussion have positive impacts on organizations. The key is to be proactive about patient engagement online. Stanford did a study looking about patients’ engagement at conferences. Typically, you will find 1 patient in the top 1 percent of influencers. While this number is low, conferences which have a higher percentage of patients active as top influencers have a greater reach. Want to increase your Healthcare voice and conference audience? Engage patient advocates online. Engaging patients is commercially valuable in amplification. Future patients get more insight as well. Audun Utengen and I looked at the data from Datapalooza and found that 11 of the top 100 influencers were patients. That is way ahead of the median number for all healthcare conferences- in 2016 the average number of top influencers that were patients at a conference was one. 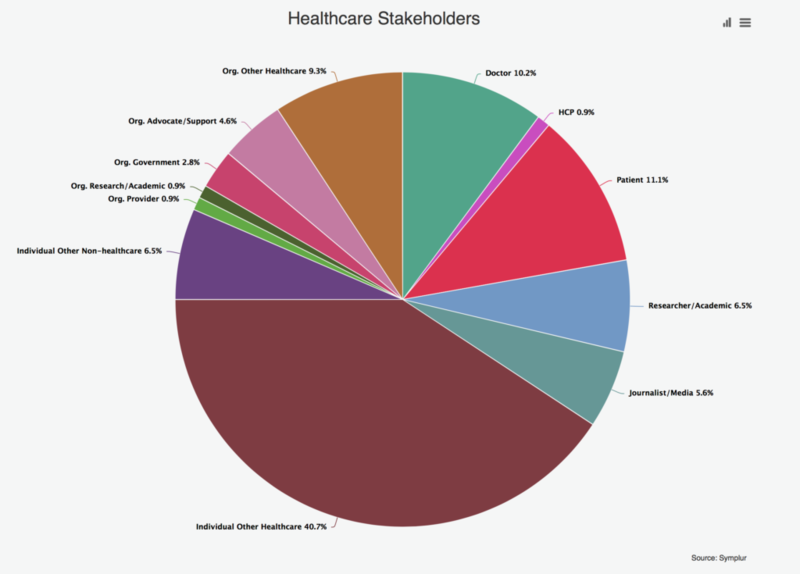 Healthcare Stakeholder breakdown of the top 100 influencers ranked by the Healthcare Social Graph Score. The ability for many stakeholders to access information and interact with each other in one place is one of the advantages of twitter. Using hashtags can help stakeholders learn about content about a specific topic quickly. 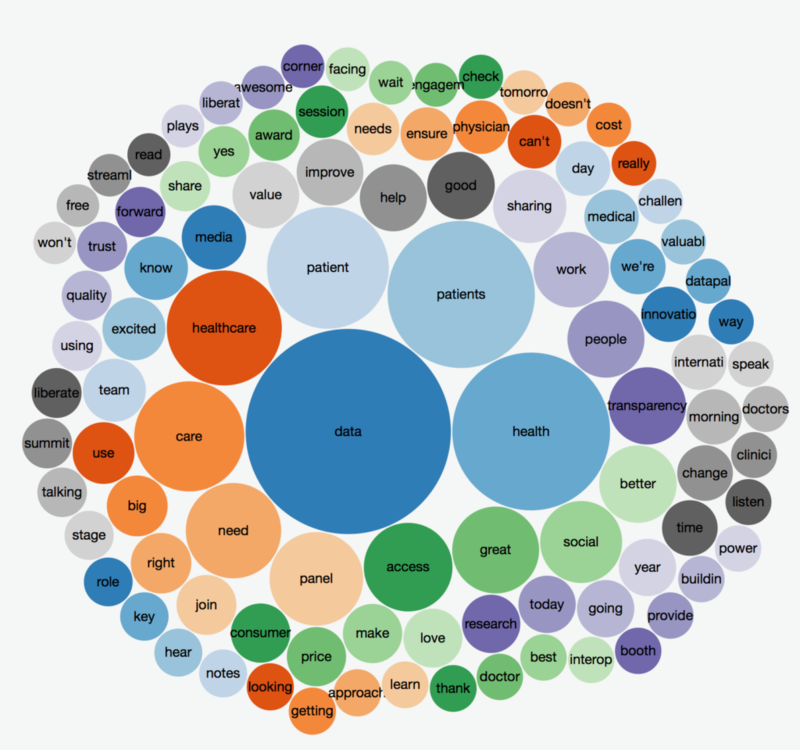 One of the things Symplur is allows is the visualization of keywords surrounding conversations on twitter. 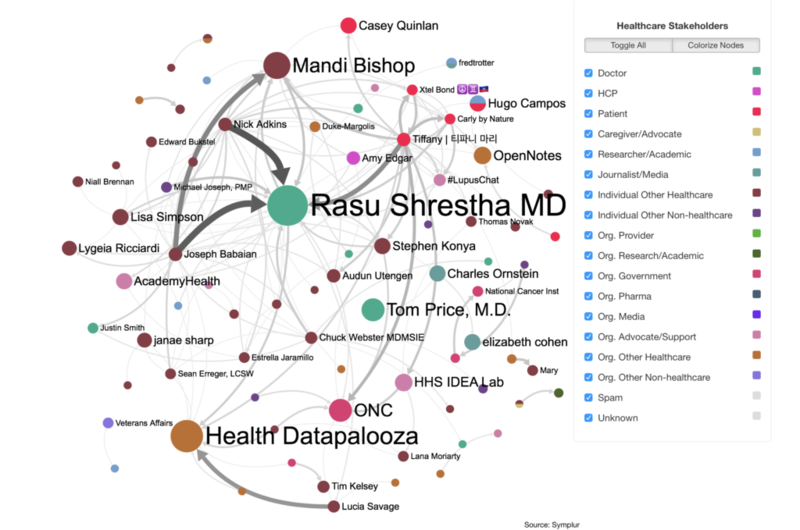 When looking at the conversations from Datapalooza the topic of “patients” was very high. Unsurprisingly, “data” is the topic of focus. Patient, Health and Patients rounded out the top conversation topics. Symplur Signals have been used for over 200 healthcare studies. 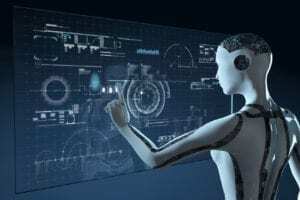 They partner with academic research centers seeking more information from online conversations. Companies can also look at competitors in their area and see how they compare. Does a nearby provider have more positive mentions on social media? Data from online interactions can also give insights into patient health. Social usage has unique implications for mental health. Frequently, online behavior change can predict mental health change. Pediatricians and Providers are in a position to see online behavior in their area and help families understand the implications. If bullying is a problem in your area providers can know their patients will have higher stress levels and provide resources and support. Certain behaviors and even emojis indicate a higher risk of depression. A suicide that will predictably happen based on social data will not show up in clinical records. Listening to what patients want us to hear will help provide greater support. The sheer volume of social data can mask its usefulness. Online activity and data can be difficult to process for many clinicians. In a world of ever-increasing data and patients reporting everything from steps taken a day to now online behavior many providers have data overload. Data insight tools such as Symplur filter data into a format that allows physicians and systems to use it to improve patient outcomes. Having cutsomers data is must for every niche. Thank you for mentioning the concept of social media insights. In regard to healthcare industry, the role social media data is more and it helps hospitals staff to know patients in a better way.